The Dremel 4000 is, by far, my favorite and most profitable tool. I’ll start by saying that I love Home Depot – I’m the wife who eagerly tears open the packages of new purchases and starts exploring their potential as my husband starts cooking dinner. My husband is loving and tolerant, and generally buys me a new tool just to get me out of the home improvement store. The day we brought the Dremel 4000 rotary tool kit home, my entire jewelry-making business transformed. Dremel has a number of different rotary tools in their line. The Dremel 4000 is the middle-of-the-line model that’s perfect for heavy home use or limited commercial use. It has great torque and variable speeds, and is made to run cool and quiet. This is the Dremel that an avid household DIY enthusiast or backyard mechanic just has to have. Of course, it’s also perfect for the crazy jewelry designer who is writing this review. I’ve pitted it against such challenging materials as metal, rock and ceramic and never bound it up. It moves through everyday polymer clay or resin like butter. A heavy-duty molded plastic case keeps the Dremel 4000 toolkit secure and organized. It’s a nice addition to keep all the little tiny pieces easy to find. The case itself is well-made and unlikely to crack. The clips that hold it together are the only really weak point – they’re just folding plastic with no actual hinge. As time goes by, the scene that holds the click sign gets strained and is starting to show cracks. Inside the case, molded compartments hold each of the Dremel accessories. A few empty spaces are reserved for future acquisitions. Among these empty slots is a spot to hold a flex shaft, which is the most useful, since it’s the first one I filled after buying this kit. One or two of the slots do let accessories loose, but this hasn’t been an issue for me since most of the work I do is in my studio. Nothing is in danger of falling out and getting lost. 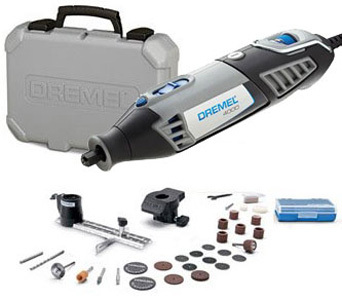 As is common with Dremel, this kit’s value jumps way up when you factor in the cost of each of the accessories. You get a detailing grip, polishing stones, engraving heads, cutting wheels, sanders and more. Dremel obviously strives to include a collection of items you are most likely to use. If you bought them separately, your wallet could easily be lighter by $200 or more. The cost for the entire kit, including the Dremel 4000 itself, the case, and all of the accessories is about $150. It’s an awesome deal that’s hard to pass up if you can use all of the included items. I’ll admit, I’ve been hooked on Dremel products for years. Every single one, without exception, has been high-quality and long-lasting. The only reason I even needed a new rotary tool is because my old Dremel got left behind in a fast-paced move where I had very little space to take my essentials. That was a light-duty model that covered most of my needs, that didn’t quite stand up to my more challenging expectations. My husband decided that my new Dremel must have more power. For the past 4 years, I couldn’t be more thrilled with my Dremel 4000. It’s easy to tone down for drilling and buffing polymer clay, but packs the punch to cut porcelain and stoneware. I’ve tried it on a wide range of rocks, including jasper and quartz, and never had a problem getting the power I needed. Whenever he can get it away from me, my husband also uses the Dremel to cut plumbing pipe and rusty bolts, sand trim, and other automotive and household applications. The Dremel 4000 has been in our family for four years of almost daily use and still runs like new. I love the accessory selection with this kit. We have used every single item at least once, and most of them a lot more than that. I’ve only had the added more specialized and a few high-dollar accessories to the lot. So far I have added a flex shaft, some tiny drill bits , a few routing heads, a variety pack of collets, and a Dremel 220-01 workstation that serves as a Dremel holder and drill press. While I’m sure I will add other tools in the future, the Dremel 4000 toolkit was definitely the right way to get started. I’ve had the Dremel 4000 since 2010, and expected to continue being my go-to power tool for jewelry design. Based on my work alone, the tool has paid for itself many times over already. Whenever this one finally wears out, I won’t hesitate to buy another.